Open spaces are ‘backbones’ of the city, important places of communication and identification of the urban society. In an era of increasing privatization and commercialization of urban spaces the design of public spaces remains as one of the most important responsibilities for the municipality. The article discusses possibilities for improving public spaces in Irkutsk. Three conceptional approaches – 1: Network of public spaces, 2: Integration of different interests, 3: Encouraging special features and spatial identity – by presenting international best practices (e.g. from Dresden, Cleveland, Oulu) are recommended as approach for sustainable city development. The article presents the materials and the key conclusions of the research and practice excursion around the three German cities (Berlin, Dresden and Halle) visited by professors and students of the Architectural Faculty of INRTU Institute of Architecture and Construction in 2016. The excursion was financially supported by the Volkswagen Foundation to analyze and summarize the successful German practices in realizing the complex programs on renovation of the territory of mass panel house-building of the 1960-1980s. nature. It is possible to live happily without money. It is impossible to do it without nature. Merging with nature was crucial in the life of this wonderful man, and even in his death. We have almost learnt to live without money. But we do not want to live without nature, and we cannot. We asked ourselves a psychoanalytical question: “Would you like to talk about it?” and then answered like honest patients: “Yes, we would”. In the context of the crisis the time is ripe for reflection, which is better to do alone with nature. This is how we approached the subject of the latest festival “Zodchestvo of Eastern Siberia” (pp. 13-46, 72-81). architects create only buildings. Architects’ materials are neither stone with its modern substitutes nor even the ivy covering construction failures. The latest Pritsker Prize laureate Alejandro Aravena says that the most important thing in urbanism is public spaces. Changeable, diverse, filled with sense and visual events, they constitute a special nature of the city. How to bring together the elements of this ‘second nature’ with living biocenoses of the primary nature? Can we always differ one from the other? By the 355th anniversary of Irkutsk, its leading architects had worked out more than twenty different designs of squares (pp. 92-112) by the mayor’s order. Besides the future squares and pocket parks of Irkutsk, several green spaces of Moscow, Tokyo, London, Paris and German towns are presented in the issue, as well as competitive designs of the New York Aquarium and the Horse Park in Korea. tension in expectation of the battle (pp. 113-123). Oleg Yavein and Ilya Lezhava bring us back to the classic of the 20th century Mies van der Rohe and his unique dialogue with nature (pp. 162-175). Relationship between architecture and nature is a rich and limitless theme, like both of these substances. That is why the new Project Baikal issue contains, as usual, more questions than answers. Such is the nature of our journal. The public housing estate 'La Hêtraie' was built 40 years ago in the municipality of Limeil-Brévannes in the Paris region. Its open spaces are still marked by their initial design. A design that does not satisfy the today's needs and wishes of the residents. A team of urban planners are now elaborating a new landscape design in relationship with the renovation of five buildings with altogether 209 apartments. The building renovation focuses on the apartments and common spaces, including wheelchair accessibility. The new urban landscape restructures the open spaces with a higher diversity of spaces, strengthens the environmental qualities, includes rainwater management and develops new uses in collaboration with the residents. The spring started with two popular architectural events in Siberia: in the beginning of March the youth Archbukhta was held in Irkutsk (8), and at the end of the same month the Archigesh was organized for mountain skiers in Novokuznetsk (12). After determination of the winners, our attention was focused on the city environment, the most trending topic of the season. Spring is the best season to take care of the city environment in general and of urban improvement in particular, because the snow melts to uncover all drawbacks of the surface relief. At the same time, contractors wake up from hibernation and are ready to manage the allocated funds. Citizens choose (now by themselves!) the public spaces to be financed by those funds. And so, the interior of the city. In April small towns and historic settlements of our big country prepared submissions to the city environment competition opened by the Ministry of Construction. At the end of May, already under the new Minister of Construction, the results of the competition were announced (40). The winners were congratulated by the Prime-Minister. The rest of the participants cannot but hope that this useful competition will be held annually. The criteria included identity: its recognizing, preservation and even creation. Already in June, Irkutsk architects, urbanists, historians and sociologists discussed the same (their favourite) topic at the Project Baikal Discussion Club Meeting held at a new place, “Boiling Point” (88). The object of the issue is Zaryadye in Moscow, a brand-new urban interior of the capital (131). Had there ever been any special sports buildings in our regional centers before the 20th century? And before the middle of the 20th century? In Irkutsk and Baikalsk there had not been any. They appeared during the Thaw of the 1960s. The buildings had innovative large-span structures and were unique. They were located in the city centers, forming important public spaces. They did not become obsolete within half a century. We begin our sport collection with them. “physical culture”. Dozens of variations of fitness and millions of participants pose a great challenge to contemporary architecture. The articles of our issue show the present and the future of architecture for fitness. We present a topical collection with a wide geographical range, including the Irkutsk Agglomeration, Tomsk, Krasnodar, sports in the Moscow Palace of Young Pioneers, and the anthology of the top foreign sports venues. The article presents a record of a round-table discussion held as part of the Festival “Zodchestvo of Eastern Siberia 2014”. The problem of identity of Siberian cities was discussed by the leading architects of Russia, urban specialists, historians, ethngraphers, cultural specialists, etc. Different debatable opinions on the past, present and future of Siberian cities were advanced during the discussion. The article touches on the challenge launched by the new Moscow Park against the orthodox ideas of city green spaces; the necessity of stakeholders’ conscious synergetic efforts to create sophisticated urban objects; and the possibility of an outstanding innovative placemaking solution in the heart of historic Moscow. The author positively characterizes the appropriate healing of the ‘hole in the landscape’ which used to be in Zaryadye; the solution for a new pedestrian fragment of the Moskva River embankment; and the creation of the environment with functional diversity suitable for today's 'homo selfiens'. The author critically characterizes the correlation of the new structures of the park and the historic development of Varvarka Street; the lack of participation of the society in the development of the park; and the dominating administrative ‘top-down’ approach typical of Russia. The article reviews the results of the 17th session of International Baikal Winter University of Urban Planning Design, the subject of which was “The System of Urban Centers. Formation of Public Spaces”. The international teams presented their reconstruction projects for urban areas, including periphery districts of Irkutsk. The teams proposed various scenarios for using the public spaces in different time, by different categories of users, depending on the functions of public spaces. It is crucial for a present-day big city not to reduce the process of spatial planning to elaboration of a formal master plan and other town-planning documents. The spatial planning should flow from the city development strategy and be based on real economic projects and demographic potential. 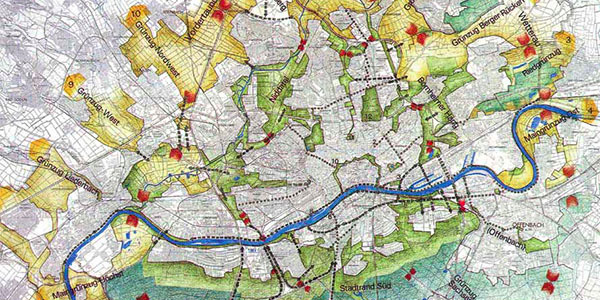 At the same time, strategic planning should include a spatial component, because implementation scenarios for strategic plans come from the condition of the territory, possibilities and limitations of urban space. The article presents the basic concepts of the project on creation of the zone of advanced economic growth “Tomsk embankments” in Tomsk. Disconnected territories in the center of the city containing a lot of slum houses, industrial, household and warehouse facilities are united through the system of public spaces that opens the city toward the river. A modern and good-quality level of territorial development is provided by reinterpretation of functionality and the use of platforms for formation of “new territories” in the interdam space. The first impression of the city is created by a bright architectural character of landmarks. The article reviews reorganization of the territory of the Silk-Weaving Factory “Red Rose” in Moscow’s Khamovnichesky district. It presents the concept for transformation of an unprofitable Soviet enterprise into a multifunctional business center. It studies the cases that occurred during designing and realization of the project, as well as interaction with investors, clients and partners.